The following items describe the various services and steps we take to ensure your employee engagement survey process is successful. The onsite consultation meeting prepares your organization’s management team for an effective and positive employee survey process. A DecisionWise senior consultant and project manager will meet with the client to brief the senior leadership team, work with the HR team on rolling out the process, and conduct focus groups with employees. Alternatively, the pre-survey meeting can occur via conference call. DecisionWise can conduct focus groups to understand the needs of the executive team, HR, and different groups of employees. A senior DecisionWise consultant moderates these one-hour meetings to identify the most important issues and drivers of engagement for each employee group. The results from the focus groups are compiled into a summary report which is used to design the survey. Because employee needs and demographic needs may vary, we may recommend using different versions of the survey for separate employee populations. A customized survey is the foundation to a successful employee engagement survey process. The survey must be tailored to the current needs of the organization and use relevant questions that collect actionable feedback from employees. Employees need to feel that the questions address issues that are important to them and will drive organization performance. DecisionWise customizes each employee survey to achieve this purpose. To create the survey, the client works directly with a DecisionWise expert in Industrial/Organizational (I/O) Psychology and survey design. The consultant will develop an employee survey to accurately measure employee engagement in the organization. This survey will include tested and validated items to collect actionable feedback that can be used to make organization improvements. A draft survey will be created and then reviewed with the client. Any additional changes will be incorporated into a final version that will be set up online. DecisionWise has translated surveys into over 30 languages and worked in over 70 countries. We work with a third-party translation company to translate the text. The translated versions are then sent to the client’s local (in-country) HR representative for final review before being set up in the system. We work with each organization to develop the most effective roll-out process for the survey. We help our clients develop strategies and incentives to encourage high participation. 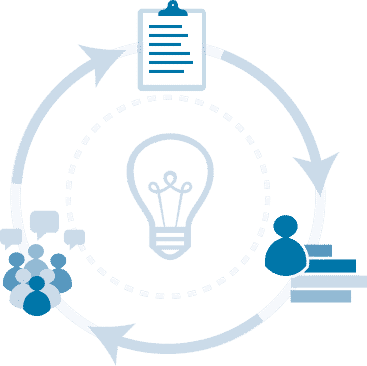 A dedicated DecisionWise project manager makes the process easy and ensures that the feedback is collected in the most efficient and professional manner. DecisionWise can match demographic information provided by the client (i.e. tenure and gender) to individual responses based on email address. This eliminates the need to ask demographic questions on the survey and provides more accurate reporting. In order to maintain confidentiality, results are only reported for groups that have five or more responses. The client provides the employee list to DecisionWise, and the project manager loads the information into the survey system. 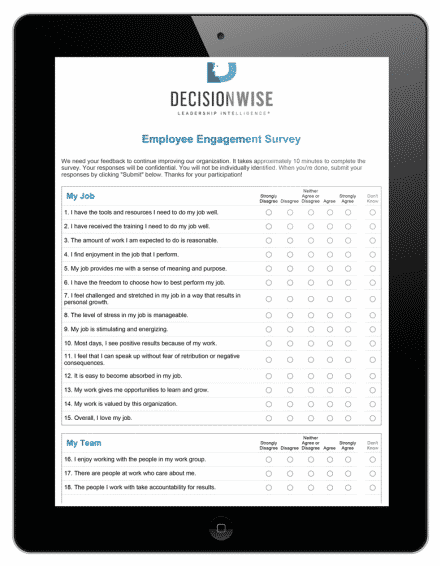 Each employee will receive an email from DecisionWise containing a unique link to the online survey. Users will be able to take the survey only once. DecisionWise tracks participation and sends reminders to increase participation. An online real-time participation report is provided to the client to monitor progress. Those employees without an email account or online access will be provided a paper survey. DecisionWise can discretely code the paper surveys by individual employee, manager, or department to ensure accurate reporting. The project manager will assist the client to implement the best process to distribute and collect the surveys to achieve a high participation rate. We recommend that paper surveys be administered to groups of employees at a time. One employee is designated as proctor to collect the completed forms, put them in a FedEx box, and send them DecisionWise. Paper surveys are processed using Scantron bubble-sheet forms for accuracy. Benchmarking comparisons by best-in-class, industry, job function, etc. Open-ended comments provide a wealth of qualitative information and provide detail on the reasons behind the scores. DecisionWise will categorize and interpret this data in order to provide meaningful insights into the results. A DecisionWise project management team will read through all of the survey comments, analyze the information, and categorize the responses by theme. Categories will be defined with input by the client. DecisionWise will report the frequency of each type. The Employee Engagement Profile is an in-depth analysis and interpretation of survey results tied to key business metrics. This report is a summary of the results derived from a comprehensive statistical analysis. Based on the analysis, we also provide recommendations for improvement. The results are normally presented to the senior leadership team by a DecisionWise consultant and project manager. The Employee Engagement Profile provides information critical for leaders to turn the employee feedback into action. A senior DecisionWise consultant will present the employee engagement survey results to the executive team and conduct an action planning meeting. The consultant identifies the major themes, key insights, and benchmarking comparison information from the survey and provides recommendations for improvement. A DecisionWise consultant and project manager will meet with HR leaders to review all of the reports and develop a plan to rollout the results to the organization. HR leaders will learn about engagement, how to interpret the results, and their role in conducting action planning meetings with managers. The focus of this training is to create subject matter expertise around engagement, to define the company strategy for report roll-out, and to clarify HR’s role in supporting the change process. DecisionWise assigns a minimum of three teams to work with each client. These teams include a consulting team, a project management team, and account manager. The consultants lead the project, provide advice on best practices, deliver coaching and training, and consult with internal leaders on key decisions. The assessment team administers the surveys, generates the reports, and acts as the main contact for support. This team coordinates the survey customization, setup, administration, reporting, and deliverables with the client. Additional assessment advisors are assigned to each client as needed to support the process. The account manager provides pricing, proposals, and contract support to ensure that services meet and exceed client expectations.